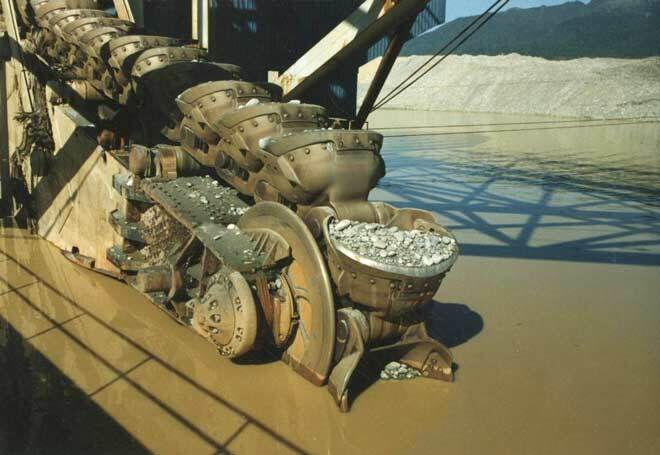 This close-up shows the end of the ladder, where the buckets scoop gravel up from the river bed – the bucket lips are shiny and worn from the scouring effect of the gravel. These buckets are on a dredge that operated at Ngahere on the West Coast. The ladder had 104 buckets, each holding around half a cubic metre, which allowed the dredge to process 1,700 tonnes of gravel per hour.